The Great Skua (Stercorarius Skua) occurs in the northern Atlantic and breeds on the islands and along the coast cliffs or on moist upland coastal heaths on Svalbard, Jan Mayen, Bear Island, Iceland, Faroe Islands, Norway and the UK. TAGS: Bird painting of Great Skua, bird sketch of Great Skua, bird drawing of Great Skua, bird art of Great Skua, bird illustration of Great Skua. The great skua (Stercorarius skua) breeds in Iceland, Norway, the Faroe Islands, and the Scottish islands, with a few on mainland Scotland and in the northwest of Ireland. The pomarine skua (Stercorarius pomarinus) or pomatorhine skua, known as pomarine jaeger in the Americas, is a migrant seabird, wintering at sea in the tropical oceans. Parasitic Jaeger (Stercorarius parasiticus) also known as the Arctic Skua or Parasitic Skua. 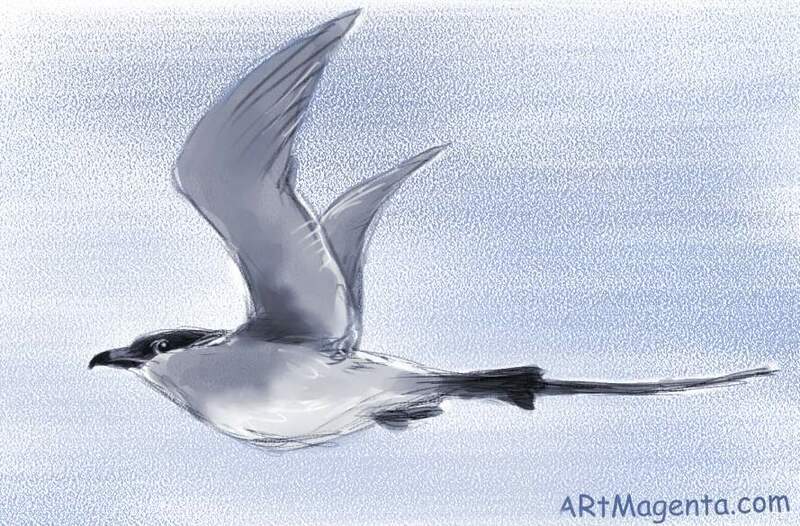 The bird occurs circumpolar and it's range covers the Arctic Ocean and North Atlantic coasts and islands. 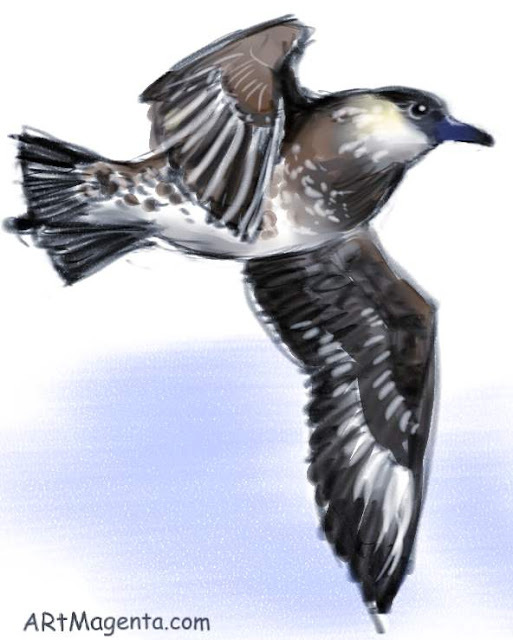 Arctic skua breeds in Alaska, Canada, Greenland, Iceland, Norway, Sweden, Finland, and Russia's coasts, in the tundra of northern Canada and northern Russia, and in northern Britain and the Faroe Islands. The Longtailed Skua (Stercorarius longicaudus) has a circumpolar breeding distribution around the tundra and mountain areas in the northern parts of Scandinavia, Russia, North America and Greenland.